Smartphones serves as the primary media device for many people, ever since the iPhone. And if you are especially crazy about music, you might be looking for advanced music controls in your music player app, such as equalizer. Equalizer on your phone helps to alter its audio output according to your preference. Generally, a set of predefined equalizer settings (a.k.a presets) just do the work. But advanced users often prefer to use custom equalizer settings to fine tune the output. These custom settings give control over different audio frequency bands. More the number of bands available in an equalizer, better the control over sound output. In this article, we’ll explore the various ways of enabling equalizer controls on iOS, Android and Windows Phone. Note: The impact of equalizer on sound output is significant when playing music through a pair of good quality headphones or speakers, capable of providing sound output over a wide frequency range. iOS provides a host of equalizer presets under the Settings menu. These presets are a good way to modify sound output by music genre. To change the current equalizer setting on your iPhone, iPad or iPod Touch, open the Settings app, head to Music and choose EQ under playback section. Here, you can select any one from a set of over 20 different presets. But if you’re not satisfied with the available presets, there are third party music players available on the App Store that provide custom equalizer controls. Most of these apps (which offer up to 10-band equalization) are paid ones, but there are a few (usually 5-band equalizers) that are available for free. Equalizer+ is a free audio player for iOS that has a 5-band equalizer built into it. The app can access the iOS Music Library so that you can play songs stored locally on your iPhone. The app allows you to configure custom equalizer settings for your songs, and save them as presets. The app includes a bass booster setting to amplify the low frequency sounds. In addition to custom equalizer settings, the app provides 10 different equalizer presets based on different music genres – Acoustic, Classical, Dance, Electro, Flat, Hip-Hop, Jazz, Pop, R&B and Rock. The app is available for free on the App Store, although it includes in-app purchases to unlock extra features such as Bass Boost, Visualizer, Preset Saver, etc. However, there is no option to increase the number of configurable equalizer bands. If you want an equalizer app with more customizable equalizer bands, you may want to try the other alternative apps mentioned below. n7player is another third party music player app for iOS with a lot of customizable options. The app includes a 10 band equalizer (with Pre-amp) to tune and enhance your music listening experience. There are a number of equalizer presets available, but the app also allows you to save your own custom ones. Separate bass and treble controls are also available to help you boost the respective outputs. n7player is available for free on the App Store, but in order to unlock the 10-band equalizer, you need to upgrade the app via in-app purchase. Musify is a paid music player app for iOS with a built-in 10-band equalizer and bass booster. With only a $0.99 price, it is one of the cheapest music apps which includes a 10 band equalizer. It can access and play songs from the iOS Music Library, but it can also stream free legal music from services like SoundCloud and Jamendo. It includes over 20 equalizer presets and provides the option to save custom presets. The app claims to be the “Music player with the most powerful and accurate equalizer in the App Store”. Equalizer provides a powerful parametric equalizer to control sound output with 7 control points or lets you directly enter values for each frequency band. There are even separate equalizer controls for left and right audio channels. The Pre-amp allows you to control the overall boost, while the control points helps you to set the level across 7 different frequency bands. 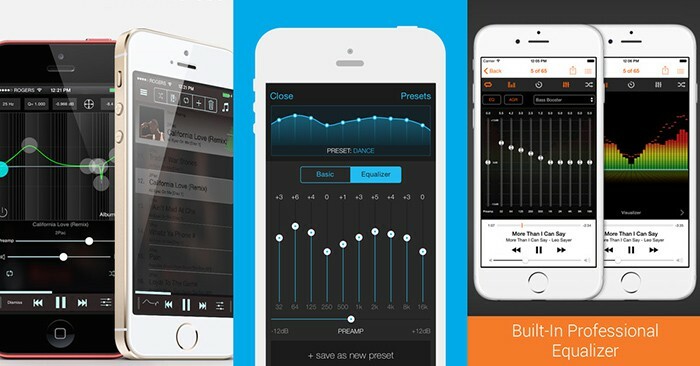 The app also lets you to choose from more than 10 equalizer presets, and even save your own. The app is available on the App Store for $2.99. Equalizer settings on Android can be customized natively from the Settings app. 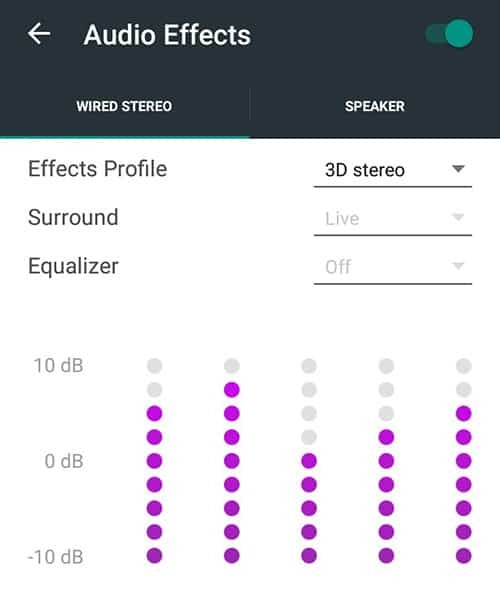 Depending on the version of Android your device is running, the location of equalizer settings are slightly different, but it is usually found under the Sound section. You can perform a web search to find out the exact location of equalizer settings on your Android device. The default equalizer on Android provides 5-band equalization with a limited number of presets and a bass boost option. For better sound enhancement with more than 5 customizable EQ bands, you can try third party music player apps such as Rocket Player, PowerAmp, n7player, etc. 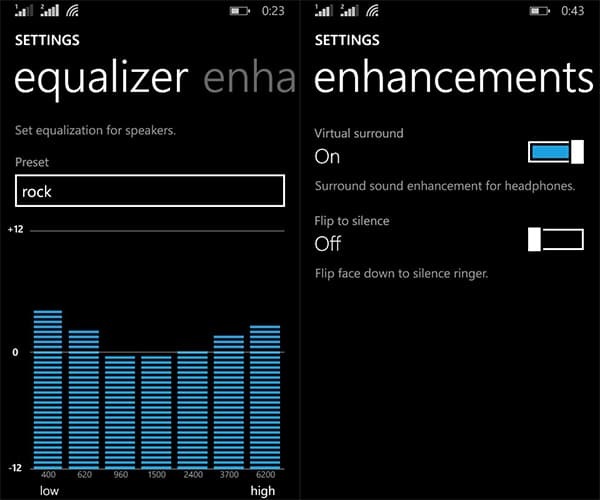 Just like Android, Windows Phone also has a built in 7-band equalizer, which can be found under Settings >> Audio on supported devices. In addition to custom equalizer, there are more than 15 presets to choose from depending on the genre of music being played. The support for equalizer primarily depends on the firmware version running on your Windows Phone device. Usually, the high end Windows Phone devices (such as the Lumia 930 or Lumia 1530) have the equalizer settings enabled since launch, whereas some others (such as the Lumia 630/635) only got the feature enabled after the latest Lumia Denim firmware update. We didn’t find any decent apps with equalizer on the Windows Phone Store yet. But according to a tweet from one of the developers of VLC for Windows Phone, the app might introduce equalizer support in a future update. We’ll update this article when the update is available, so stay tuned. If you know of any decent app for iOS, Android or Windows Phone with equalizer support that we didn’t mention in this article, tell us about it in the comments below.